I received an unexpected Amazon voucher from work a few weeks ago. I don’t really buy books from Amazon any more, simply because I would rather support actual bookshops, but I thought it would be rude not to indulge just this once! I got quite a few baking books, including Paul Hollywood’s British Baking, which contains this rather fine recipe for honey buns (you can find it online here). Despite the name, these aren’t the yeasted variety of buns; they’re more like mini cakes. As you might expect, there’s a fair bit of honey in both the cakes themselves and the wonderfully sticky cream cheese icing. 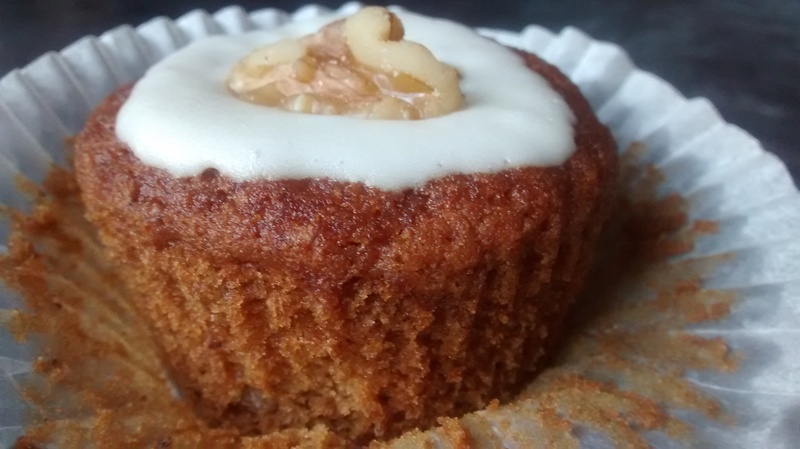 The cakes also contain chopped pecans and cinnamon. The cakes were very straightforward to make. The only issue I had was trying to divide the mix equally between 18 cases, when I could only bake them in batches of 12! As a result, I ended up with some buns that were much bigger or smaller than the others. 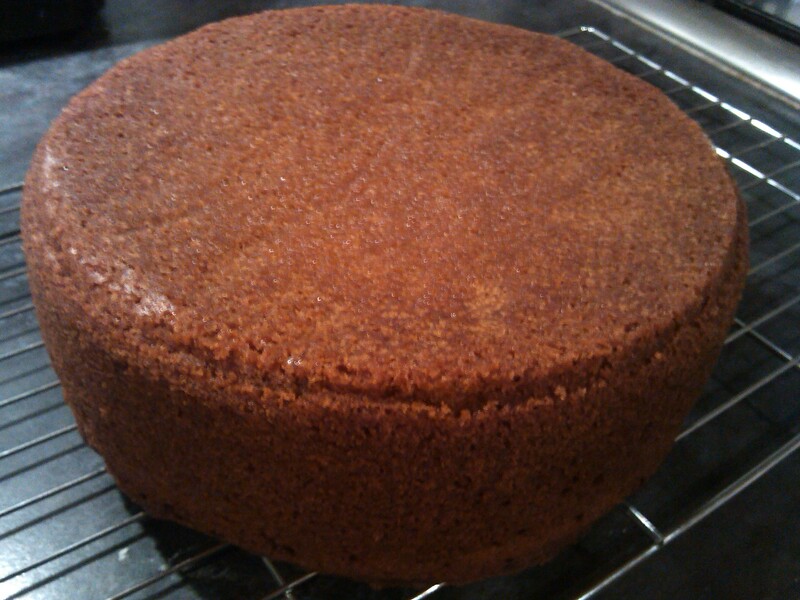 The icing was also really easy to make, although I suspect mine was a little runnier than it should have been. For once, I seemed to make the right amount of icing and didn’t end up with any left over, which is always nice. I ran out of pecans after making the cakes, so I topped the honey buns with walnut halves instead. I had two of the buns straight away, and was very pleased with how they turned out. 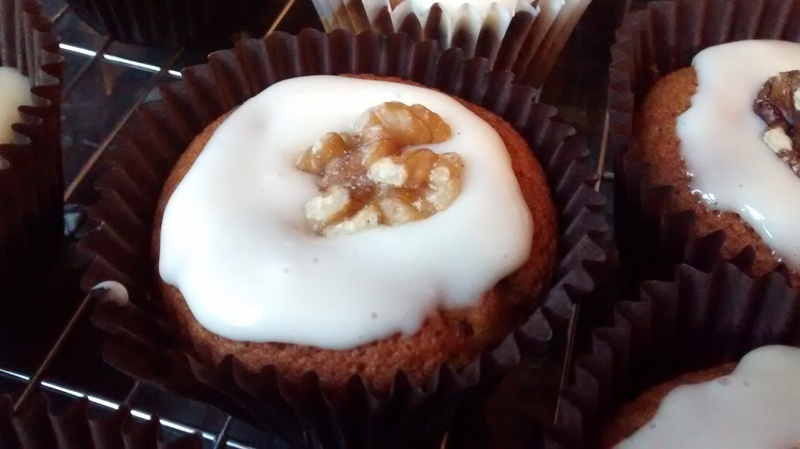 The cakes themselves were lovely – spicy but with a strong honey flavour. The icing was delicious, too – I almost wished there had been some left over so I could have eaten it from the bowl with a spoon! This is a brilliant little recipe and one I would highly recommend. 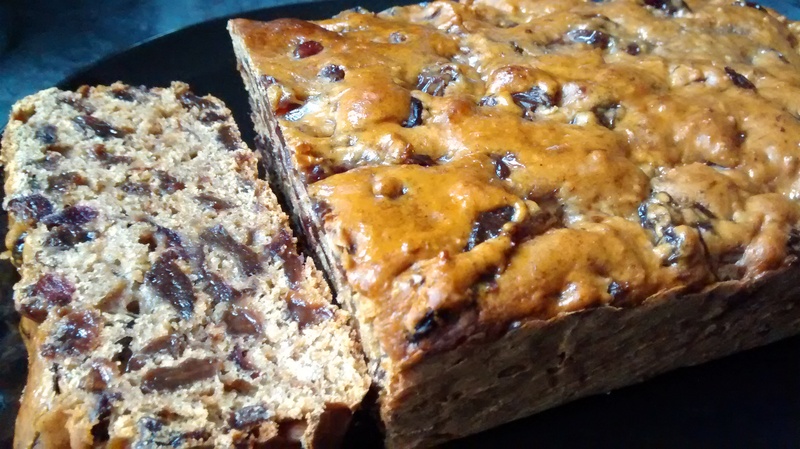 It’s worth investing in some good quality honey for baking purposes, but I managed to make these with supermarket own-brand honey and it was perfectly fine. 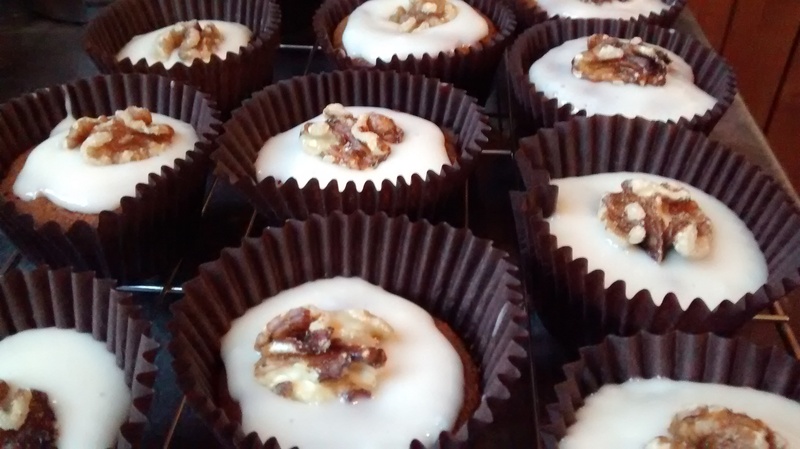 I’d love to try making these again with orange blossom honey or another flavoured honey – I suspect they’d be divine! I’ve never had much luck with cheesecake. In fact, the last time I made it was such a disaster that I decided I wasn’t going to attempt it again for a long time. 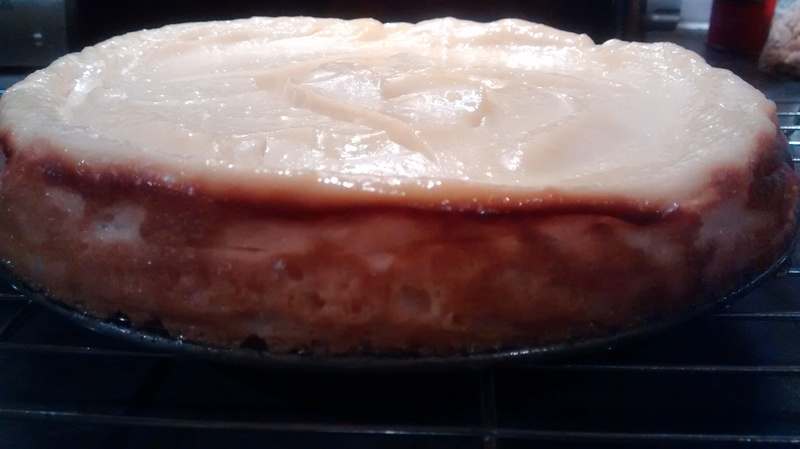 Well, I think I finally struck it lucky with this honey pie AKA melopita AKA Greek cheesecake. I spotted the recipe on Pinterest a while ago and was struck by how simple yet delicious it looked. There’s no (buttery) biscuit base here; it’s all about the honey and cheese, which in this case is a hell of a lot of ricotta (as I had no idea where to find myzithra in Manchester). I can’t stress how easy this is to make. All you do is mix the ingredients together, transfer the mix to a tin and bake. 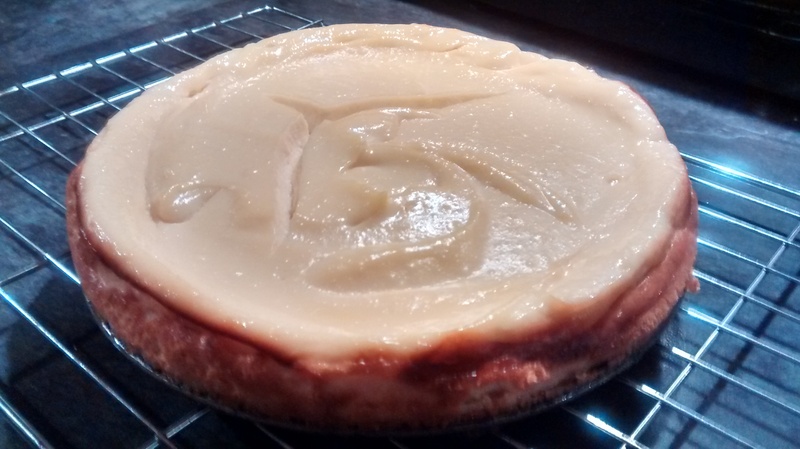 Even I couldn’t get that wrong with my cheesecake-destroying ways! I left the pie in the oven for longer than the recipe said, as it looked very wobbly and pale at the end of 40 minutes. I took it out when the top looked more set and golden. 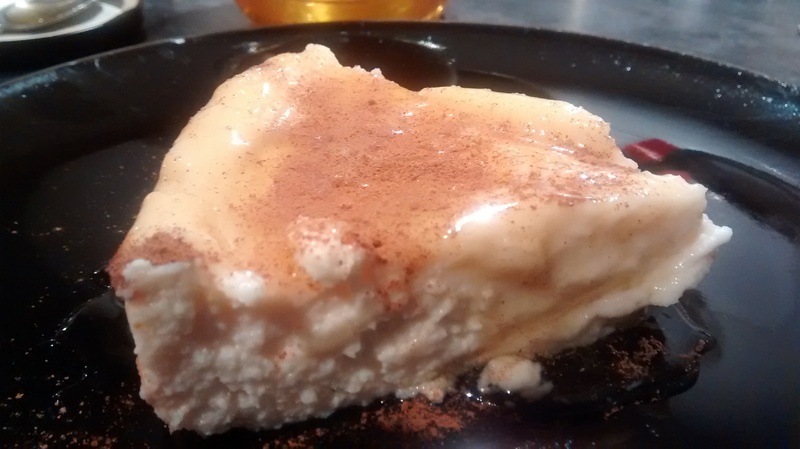 For reference, I didn’t make the whole recipe; I used 500g of ricotta instead of 600g and reduced the weight of the other ingredients accordingly. As you can see, the top cracked as the pie cooled! We had the pie as a dessert after a Greek-themed meal and served it as suggested, with a drizzle of honey and a sprinkling of cinnamon on top. 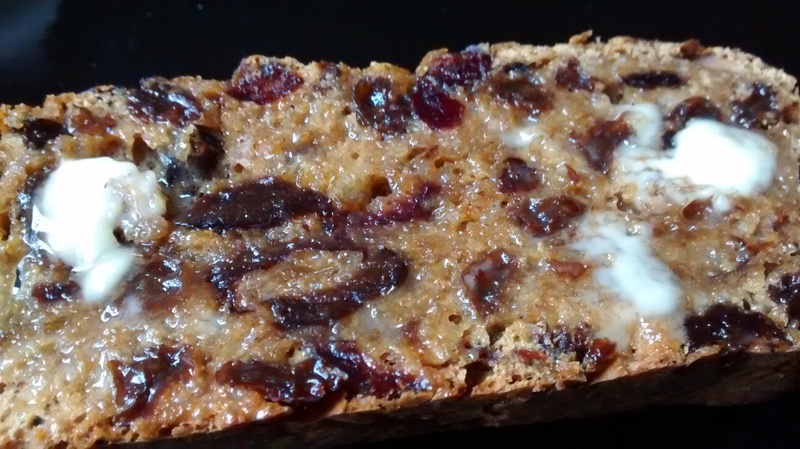 It was absolutely delicious – rich, fragrant and just the right sort of sweet. 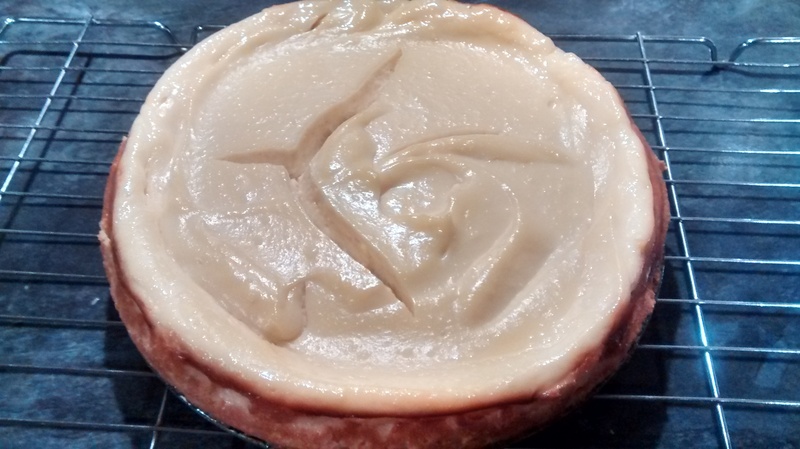 Unlike the last time I made cheesecake, I will definitely make melopita again – and soon! Can be found on the Cook Me Greek blog here. Now this is a lovely recipe for when you want something that’s sweet, (sort of) good for you and quick to make. 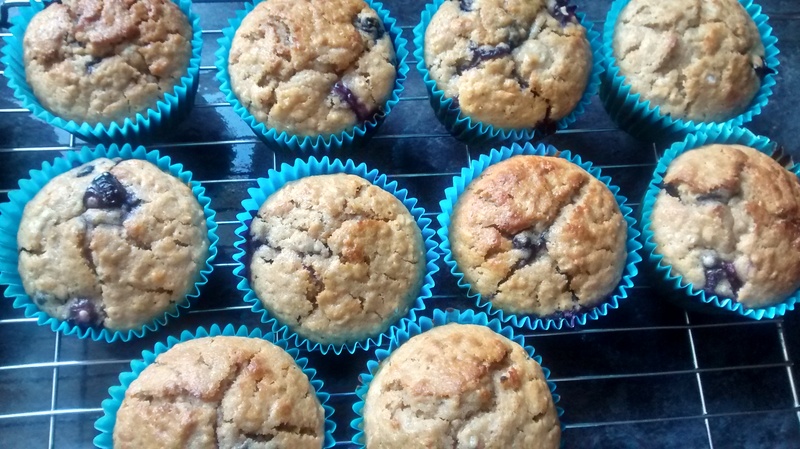 These oat, blueberry and honey muffins are really easy to whip up and are delicious – plus there’s no butter in these, just oil and milk instead, so you can fool yourself into thinking you can have more than just one! 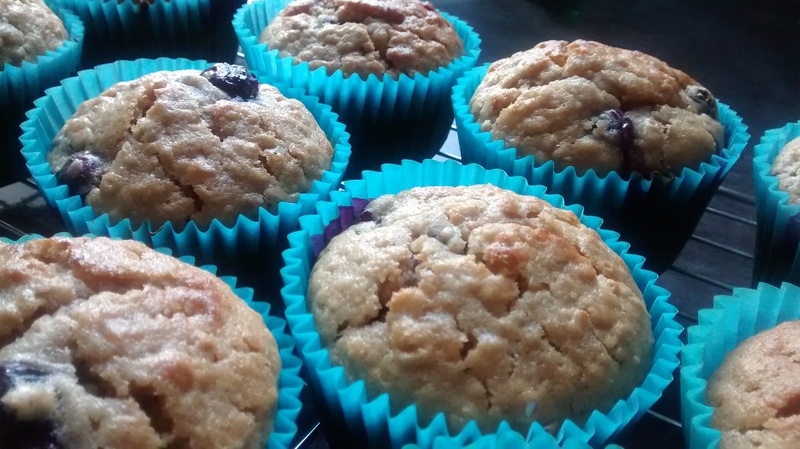 The recipe is much like most other muffin recipes – make up the dry and wet mixes, then carefully combine them without overmixing. 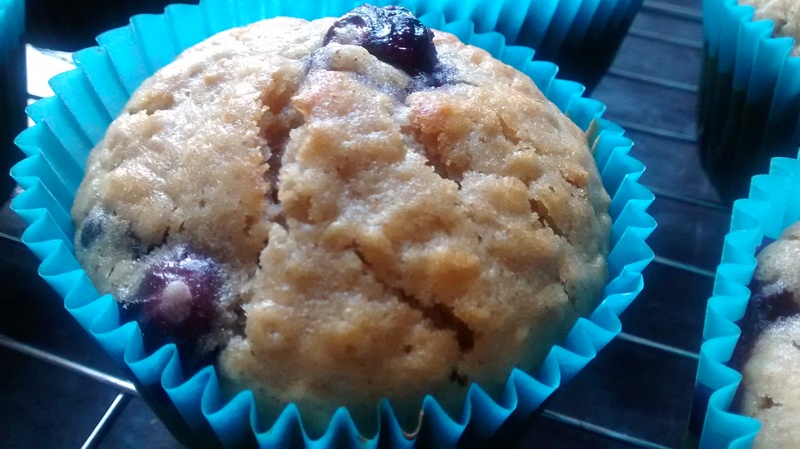 The original recipe called for raisins, but I replaced these with blueberries as I happened to have some in the fridge. 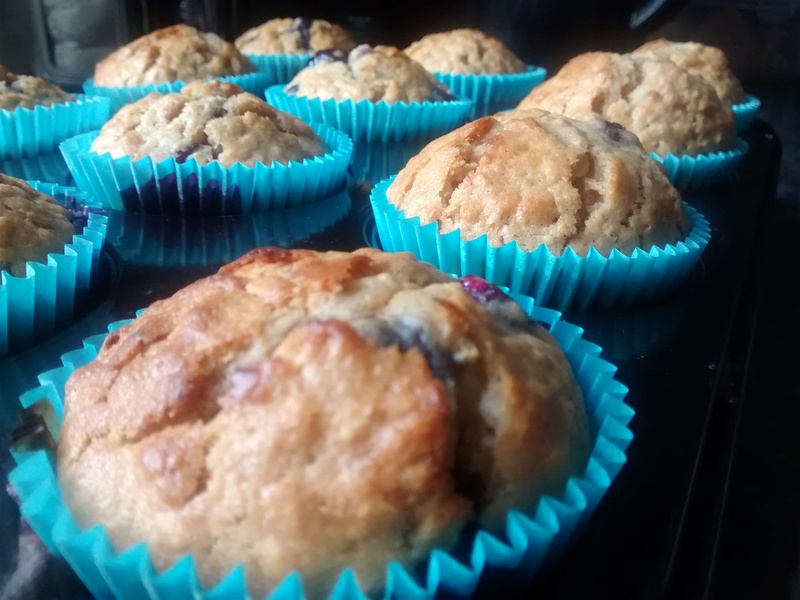 The muffins baked in 20 minutes, but I think I would give them a couple of minutes longer next time, due to the extra moisture provided by the fresh fruit. Still, these are scrumptious – not too sweet and lovely and purple inside! The original recipe says to have these for lunch with cheese or on their own with some butter and extra honey, both of which I might try over the next couple of days. If there are any left after today, that is! Preheat the oven to 200C/Gas 6/fan 180C. Line a muffin tin with 12 paper cases, or butter the holes directly. 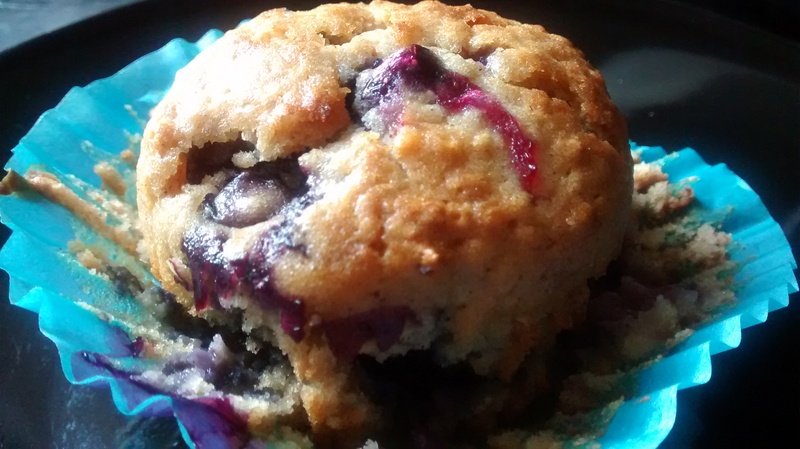 Mix the flour, oats, baking powder, cinnamon, salt and blueberries together. In another bowl, mix the eggs, milk, oil, sugar and honey. Add the wet mix to the flour mix and stir until just combined. The mix should be fairly runny. Spoon the mixture into the tin and bake for 20 to 25 minutes until risen and golden on top. 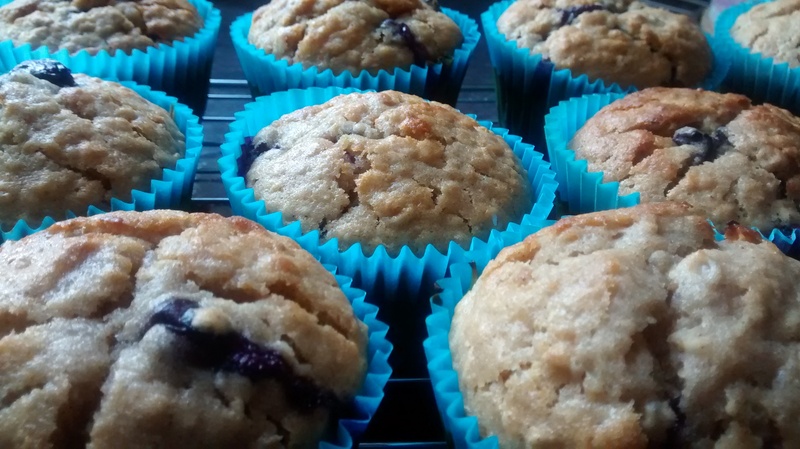 Leave the muffins to cool in the tin for 10 minutes, then transfer them to a wire rack to cool completely. Serve alone, with cheese or buttered with honey. 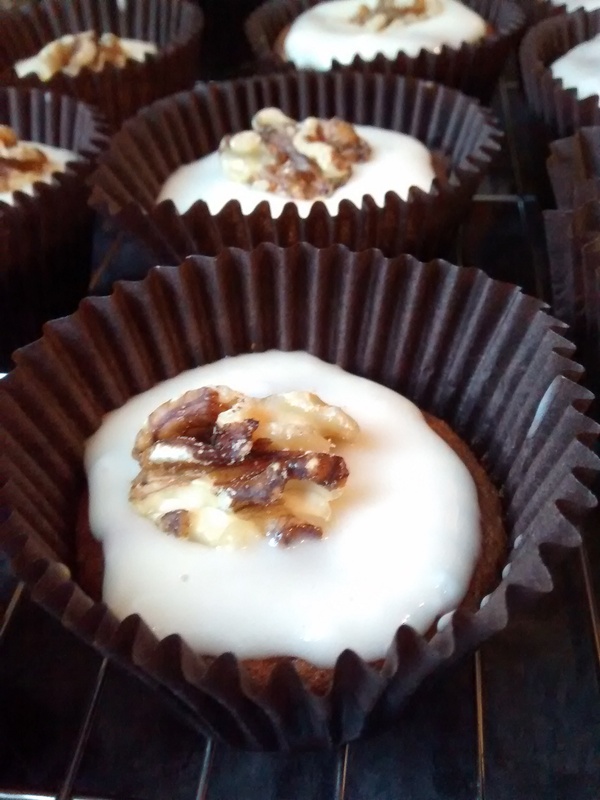 I was rather excited a few days ago when I discovered that Luis Troyano, one of the contestants on the current series of Great British Bake Off and one of my favourites to win, has a website that he updates with his own rather fantastic recipes. 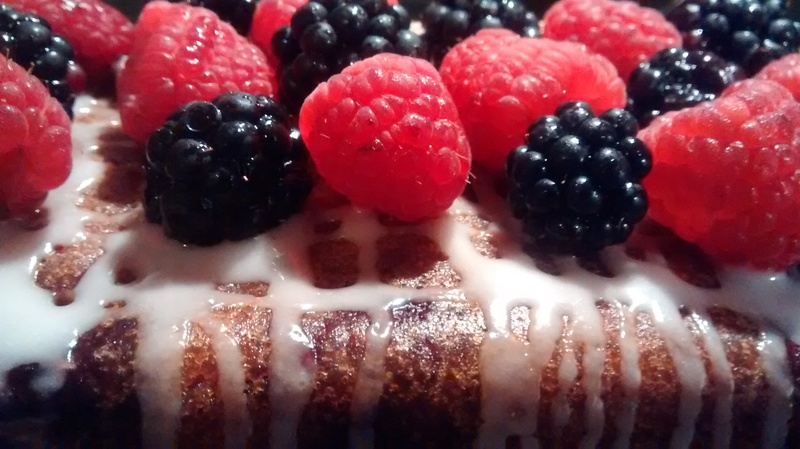 The first thing I saw, this autumn berry cake with lemon and honey icing, immediately zoomed straight to the top of my to-bake list – which meant I ended up baking it for the office’s Jeans for Genes bake sale. 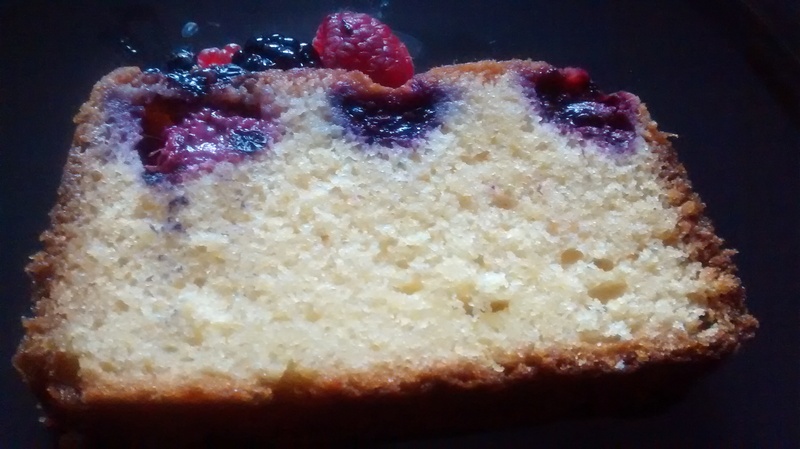 The cake was pretty easy to make – it’s basically a lemon cake that reminds me a lot of the madeira cake I like to make topped with a delicious lemon and honey icing and a pile of blackberries and raspberries. 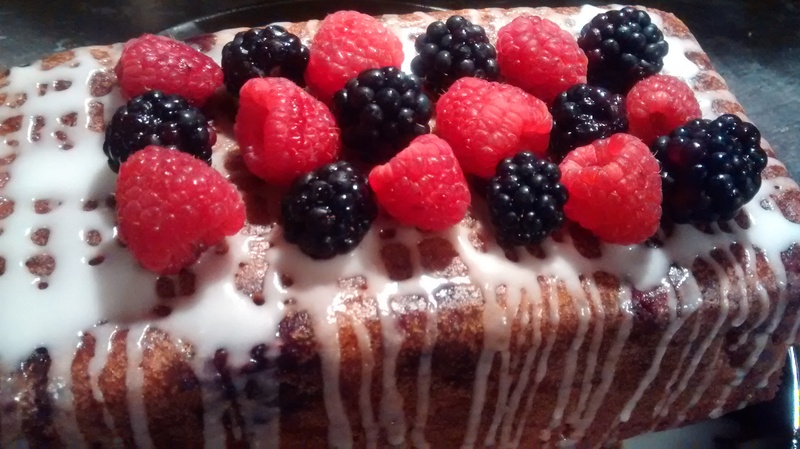 The berries also make it into the cake itself. 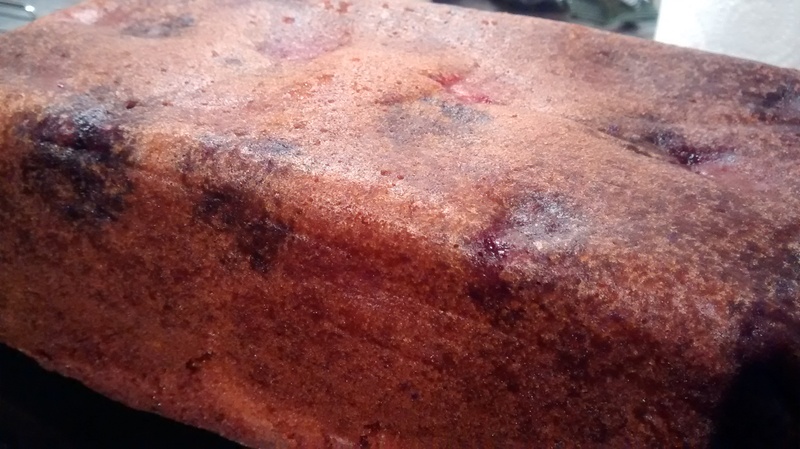 The cake mix was simple enough to concoct – you make the batter, put half in the tin and top with some of the berries, then put the other half in with more berries to finish, with the aim of having the berries distributed evenly throughout the cake. However, I was a little worried when I had to replace the 4 medium eggs called for in the recipe with 2 medium and 2 extra large from the rather fantastic Levenshulme Market. I added some extra flour to compensate, which seemed to work okay. 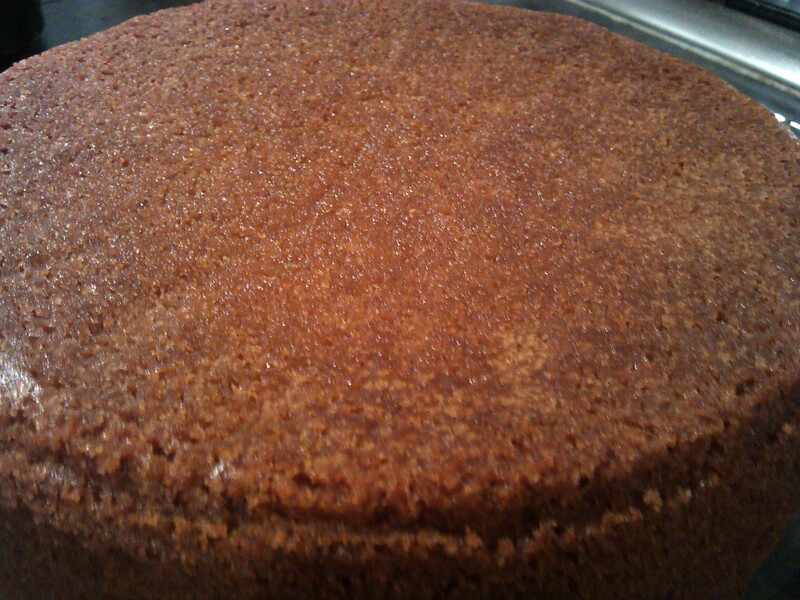 I did have a stressful time of it when I checked the baking cake after 45 minutes and found the middle was still pretty much raw! I just left it in for something like 20-25 extra minutes and covered the top with foil to prevent it from going too dark. 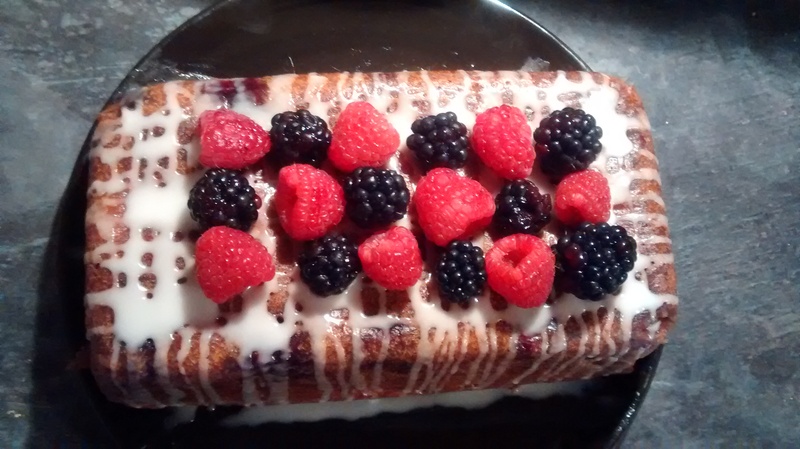 When the cake was completely cool, I roughly piped the lemon and honey icing over the top and plonked some berries on top. I left the icing to set overnight and hoped against hope that the middle would be cooked when I sliced it up in the morning – which, thankfully, it was! The only disappointment, if you can call it that, is that the berries in the mix sank to the bottom of the cake, which seems to have happened with Luis’s own cake as well. I think I would coat the berries in flour first next time to see if that makes a difference. 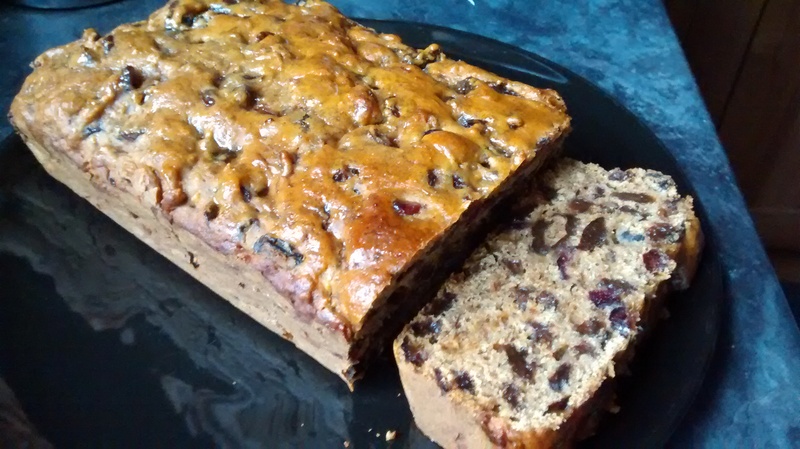 However, the sinking of the berries certainly didn’t detract from the overall flavour – the cake was beautifully moist and lemony, with the berries adding a nice sharpness and the icing offering further interest, especially with the flavoursome honey. This is a really beautiful cake that would be a lovely centrepiece for afternoon tea – I’ll definitely make it again, and perhaps try some different berries next time, depending on the season! It went down well at the bake sale and we raised a nice amount of cash for Jeans for Genes altogether, which was certainly the icing on the cake (boom boom) (sorry). Can be found on Luis Troyano’s website here. It’s an odd time of year at the moment – not quite summer, not quite autumn, at least weather-wise! 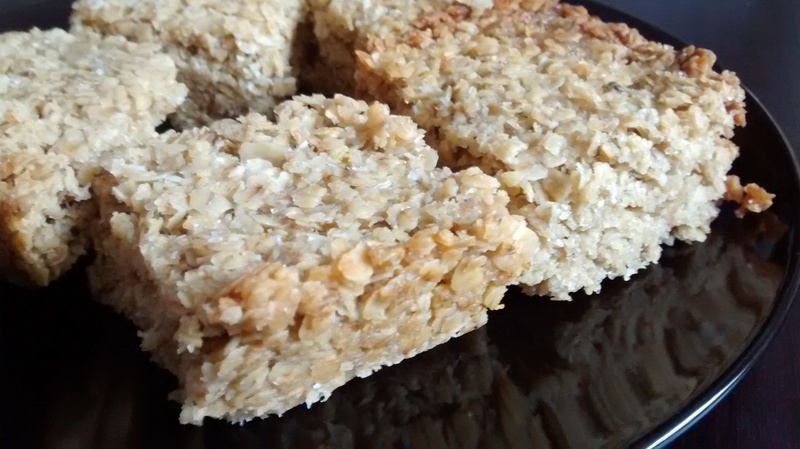 These honey and coconut flapjacks I made a couple of days ago are quite a nice expression of this seasonal limbo, with the oats being decidedly autumnal/wintery and the coconut and honey adding a splash of sunshine. It was a very easy recipe to make, which is just what I wanted after a long day at work. It was just a case of melting the honey, sugar and butter together, then stirring in the remaining ingredients. I didn’t have quite as much as demerara sugar as called for in the recipe, so I used half demerara and half golden granulated sugar. Oddly enough for me, I refrained from adding more coconut than specified. I KNOW. I felt that this would overwhelm the honey flavour somewhat, so I managed to hold myself back. 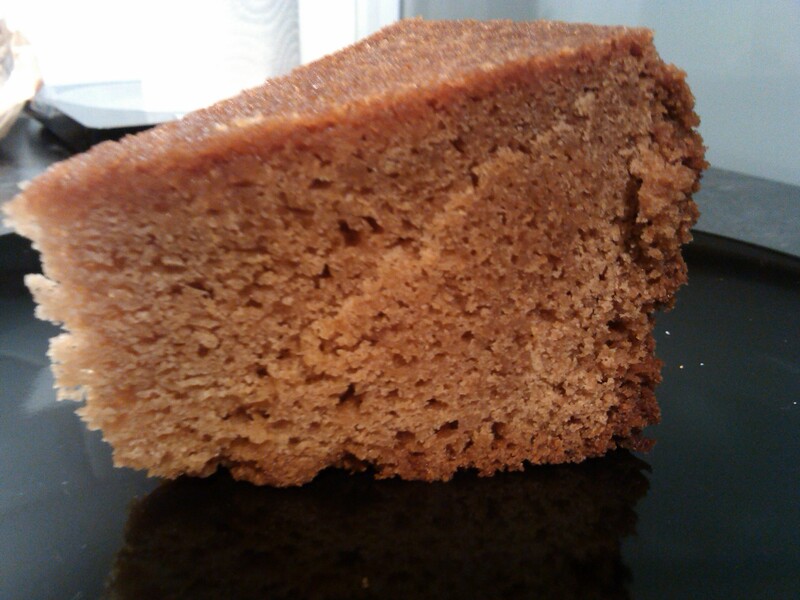 I used a slightly smaller tin than the recipe asked for and you can see this from the height of the flapjacks. They were definitely done within the specified cooking time, though. I really like these flapjacks – the honey flavour is fairly delicate but definitely there, while the coconut is, of course, a lovely addition. The original recipe says you can use dried fruit or nuts in place of the coconut, and I can imagine this would work well too. 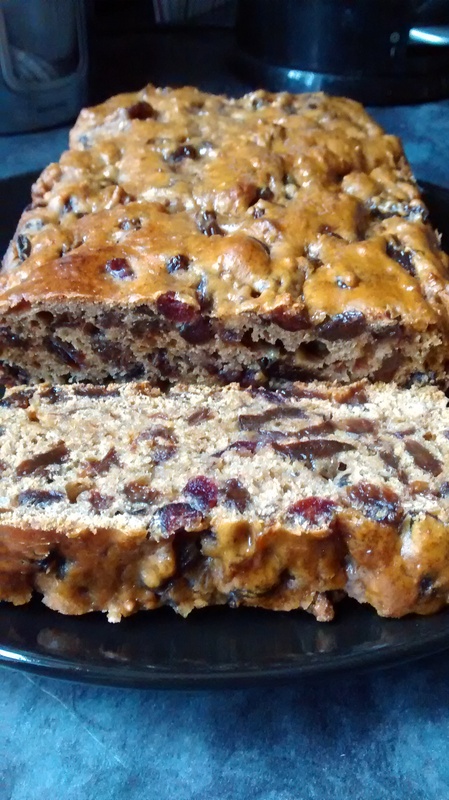 Adapted from this recipe on BBC Food. Pre-heat the oven to 180C/350F/Gas 4. Grease and line a 8 inch x 12 inch tin (I used a 7 inch x 11 inch tin and it was still fine). Melt the butter, sugars and honey in a very large saucepan, stirring frequently. Stir in the oats and coconut and mix well. If your saucepan isn’t very big, transfer the melted butter mix to a large bowl before adding the other ingredients, as there are a lot of oats to stir! 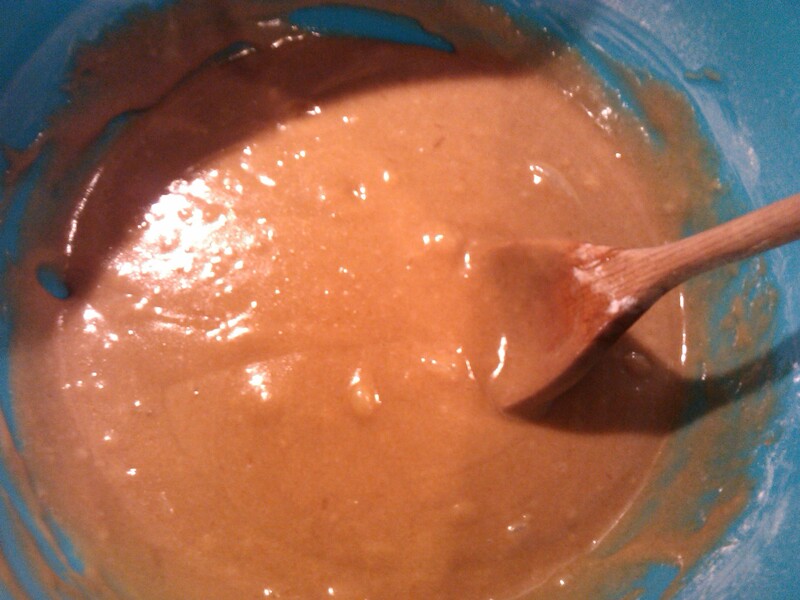 Spoon the mix into the tin and flatten the surface, making sure it’s relatively even. Bake the flapjacks for 15-20 minutes. They should be golden around the edges but still pale and a bit soft in the middle. 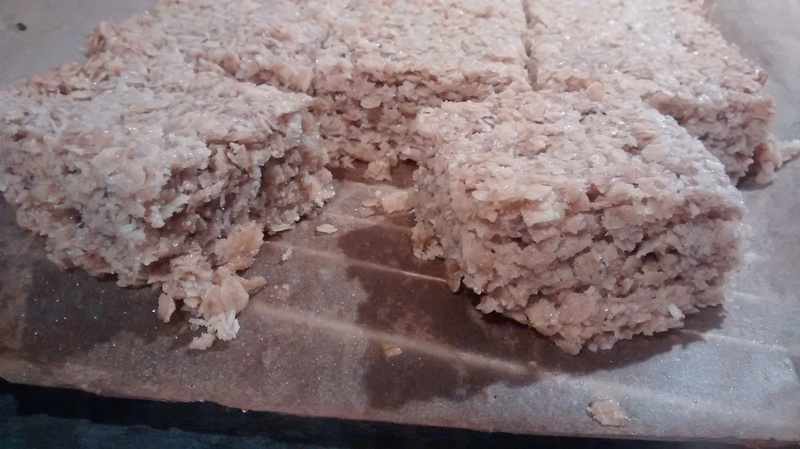 Cool the flapjacks in the tin then cut into 15 squares.